This circuit is to setup home-cinema set adjusting all the loudspeaker outputs to the same level when heard from the listening position.In practice this device is a simple (though linear and precise) 100µAac millivoltmeter. 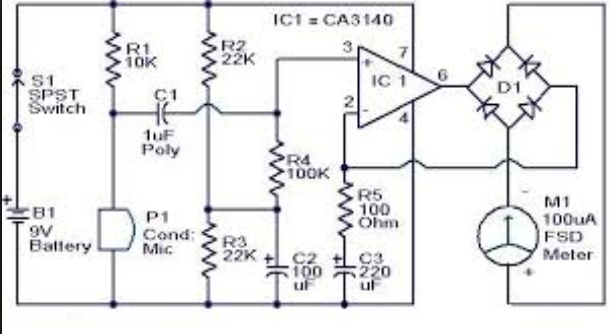 The precision of the measure is entirely depending on the frequency response of the microphone used but, fortunately, for the main purpose of this circuit an absolutely flat response is not required. Therefore, a cheap miniature electret microphone can be used. The circuit is based on non- inverting amplifier based on op-amp CA3140 (IC1).The sound picked by the condenser mic will be amplified by the IC1 and rectified by the bridge D1 to drive the meter M1.The deflection on the meter will be proportional to the pressure of the sound falling on the mic.The switch S1 can be used as an ON/OFF switch.